When I started this blog, I had a vague intention of steering it away from being another twee, mumsy, online version of a recipe scrapbook that the internet is already inundated with, but more of a ‘lifestyle bible’ in the manner of Gwyneth Paltrow’s sprawling Goop empire. Except without the conscious uncoupling and all that kale. I thought I might actually stick to this plan and delve into a few other aspects of my life that are a) interesting, and b) sort of marketable. Starting first with my ability to plan the hell out of every little detail of something, eg. a WEDDING. Most brides tend to manifest some kind of, shall we say, ‘bossiness’ as they reach the end of the planning stages of their wedding and I was no different when my time came around. I was a little dictator: but I was the benevolent, kindly type, not the savage despot type. My subjects adored me. I ruled with an iron fist in a velvet glove. Having had prior experience in planning events and catering meant that I was armed with all the tools I needed to be incredibly annoying to all who were related to me or had unwittingly become my friend at some point in the last 25 years. 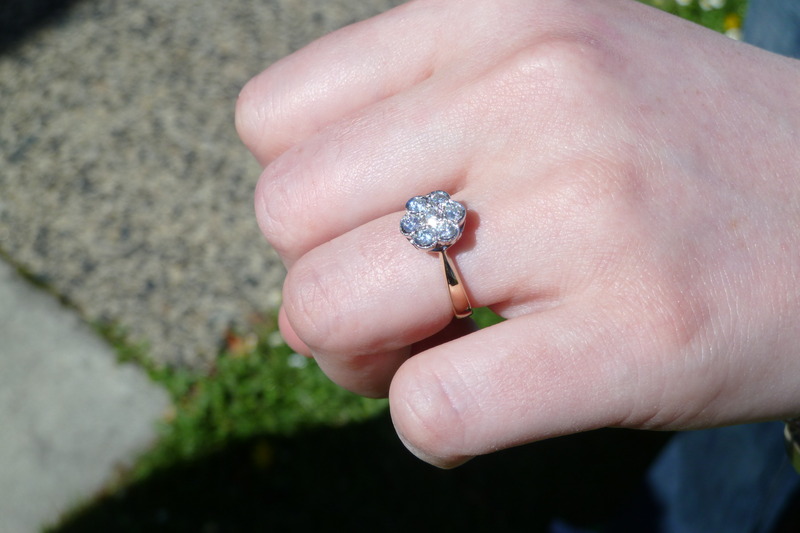 It all began when I was proposed to, one evening under the stars. Well I would have been if we had a sunroof in our station wagon. And it really began about four years prior when I started pointedly wondering out loud whether I would ever be a bride, within earshot of my now-husband. Actually now that I think about it, it was summer, so it was dusk and there were no stars out anyway. I forgot to actually respond to the important question that had been posed because I was too busy wailing unattractively. The proposal is not the point of this post though, so we’ll move right along. After a photo of my ring. My husband works for the Department of Conservation. If our government symbolised a cross-section of our society (odd concept, I know) then DoC would be the alternative-lifestyle commune living in a tent village in the woods. For that reason we chose (and by ‘we’ I mean ‘me’ and will continue to do so for this whole post) to have the wedding at Orokonui Ecosanctuary, a protected wildlife reserve with a fancy sustainably-built visitor centre, in the hills outside of Dunedin. We chose a ‘native birds’ theme to tie in with the setting of the venue, and because they are cute and pretty and feminine. My husband was all for this choice of themery and was heavily invested in the decision-making process every step of the way. I made my own wedding stationery, because I had the skills required and I thought it would be cheap that way. It really wasn’t. 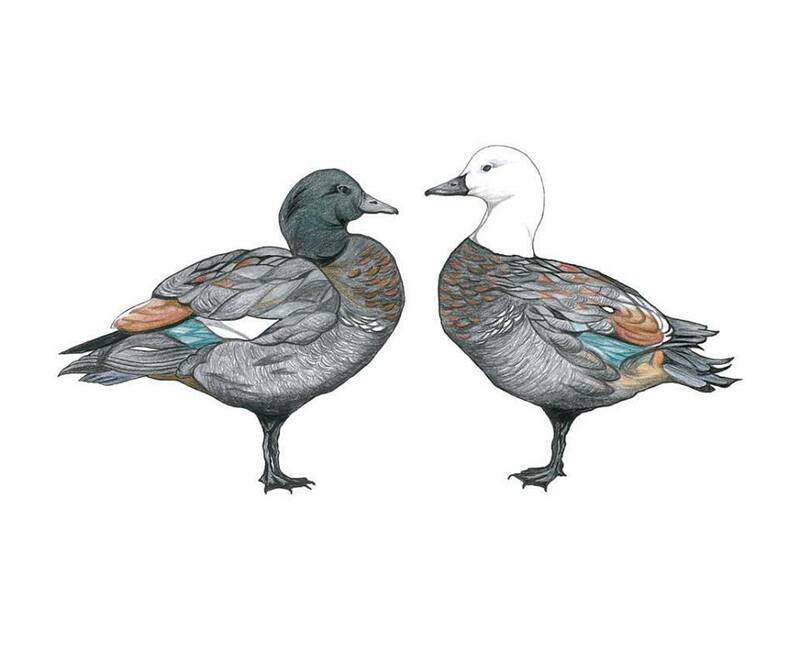 I drew a pair of paradise ducks, which are native ducks that mate for life. They formed the basis for the stationery along with a similar drawing of a feather that we used for the design on the R.S.V.P. cards and ‘thank you’ notes. The female is the pretty one with the white head and the more regal, dignified posture. Once we had gotten the invitations out, we had to start really thinking about ALL the other stuff we had to do in order to pull together a respectable nuptial event. Because we had chosen to have a cocktail-style reception, it cut out a lot of the details that would be fun to design but also expensive and difficult to organise when I was not getting the wedding catered by a company but by my foodie friends and some of my chef-lecturers. 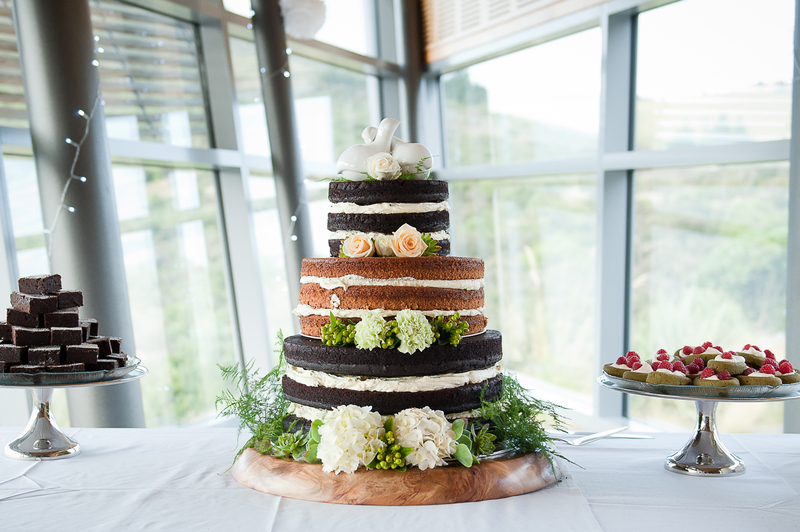 We wanted the cake to be one of the stand-out parts of the decoration, because the venue itself was so stunning in a simple way and it had huge windows showing the bush and coastal scenery so it needed very little in the way of decoration. I asked my friend Robyn to make the cake as a wedding gift. We decided on a naked cake; don’t worry, it’s just a cake that isn’t enrobed in fondant, so you can see the layers of cake and filling. We had picked out a pair of china birds to be the topper for the cake and opted for some fresh flowers to match my bouquet. People don’t eat the flowers made out of icing anyway, and I hate fondant because I think its like being forced to either eat plastic or peel it away from an otherwise delicious food item, so this was the ideal cake for me us as a couple. My mum and I chose my wedding dress about a year before the wedding, so I had to undertake some healthy and controlled weight management to make sure I would still fit into it. Because I am completely awful, I abandoned this concept shortly after coming up with it and instead opted to do some dodgy crash-dieting near the end-zone. If you mashed together the South Beach, Atkins and something similar to Paleo but with a lot more Diet Coke, you’d be irresponsibly punishing your body in much the same way I was. I started running again, having once said I would no longer bother running unless something or someone was chasing me. But I didn’t have time to lie on the couch and eat cinnamon buns anyway, because I don’t ever do that, and because I still had HEAPS of bride things to do with only two weeks to go. Guess who was hanging out in their little tent village in the woods with their alternative-lifestyle buddies while all this was going down? At this point, the food had still not been organised. I think I went a little bit insane. Something to do with the lack of delicious carbs affecting my cognitive processes. Six days before the wedding I called in the only person that could help/would tolerate the situation: my friend Amanda. We spent a whole day shopping in every single location that sells food in the greater Dunedin area. I am only exaggerating a little bit. I redefined Amanda’s understanding of the concept of a shopping list. I glimpsed true fear in her eyes when she saw how much food she had to help prepare in the coming days, but I chose to ignore it. 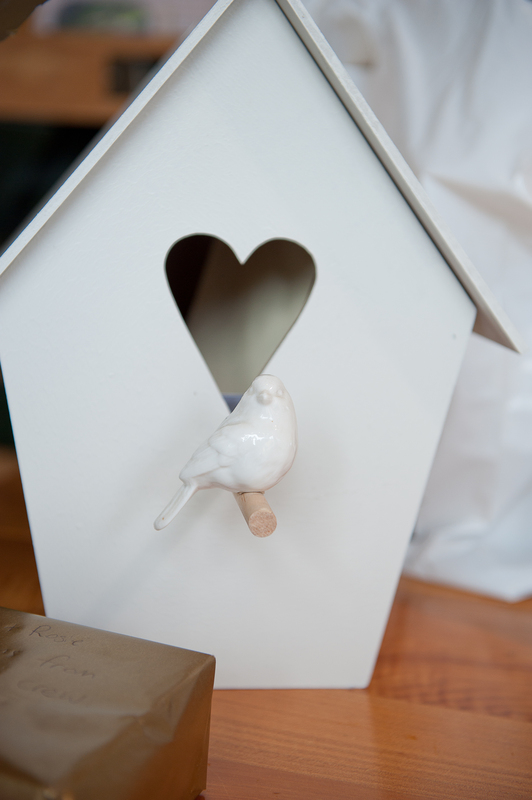 For almost the entirety of this time that I was agonising over all manner of final details, my mum was busy sewing the bridesmaids’ dresses and my stepfather had been enslaved enlisted to make us an adorable little birdhouse which we would use like a letterbox, for the guests to put cards into when they arrived. I don’t know what I was expecting (mainly just a box with a roof and a hole for the imaginary bird to fly in), but it was not this masterpiece of craftsmanship. For a humble, retiring kind of guy who declined to do a reading or a speech, it was a different testament to the effort he put into the wedding and has put into looking after me for most of my life. With everything planned out and everyone issued with their personalised wedding schedules and SO MANY lists ticked off, there was nothing else to do but try not to panic, wait for my fiancé to wander out of the bush and pick up his suit and tie from the rental place, and just let it all happen. Be sure to tune in for the concluding instalment, in which I actually get married. SPOILER ALERT: I did panic.